We use a variety of medicines that we acquire by prescription or over the counter. As with nearly everything we purchase, we need to dispose of these chemicals in a safe and proper manner. Many people dispose of these by tossing them in the trash or flushing them down the toilet. We may think small amounts of these materials have little or no impact. However, many pharmaceuticals have been found in surface & ground waters and have had noticeable negative effects on wildlife as a result of such disposal. Medicines used in the home are the leading cause of poisonings, especially among children and seniors. If such chemicals are no longer needed, it is best to dispose of them safely and properly. Where Can You Take Your Pharmaceuticals? The Bennington Police Department has a container in the lobby of their building, and pharmaceuticals can be dropped off in that container 24/7, and they accept pills and patches. 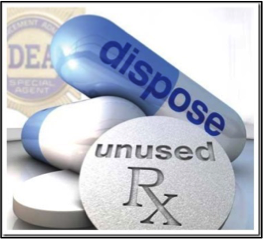 Prescription drugs in their original containers can be dropped off with dispatch 24/7, and they accept pills and patches. Pharmaceuticals can be dropped off between 7:00 AM and 4:00 PM, Monday through Friday. They must be in some container such as a bag or bottle, and they accept pills and patches. Pharmaceuticals can be dropped off at Southwestern Vermont Medical Center 24/7 and they accept pills, patches, liquids and aerosols. Hours are M-F 8:00 AM to 7:00 PM, Saturday, 8:00 AM to 6:00 PM and Sunday 9:00 AM to 3:00 PM and they accept pills, patches and liquids. Hours are Monday-Friday 8:00 AM to 7:00 PM; Saturday, 8:00 AM to 6:00 PM and Sunday 9:00 AM to 12:30 PM. Store hours are Sunday through Saturday, 8:00 AM to 10:00 PM.